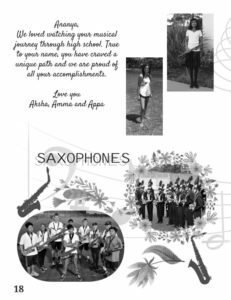 Show your student how proud you are of them with a customized message in the End-of- Year Concert Program! 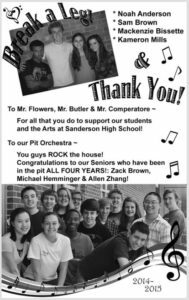 You can place a personal message to a student, section, staff member, or the entire group! Full Page Tribute- $50: A maximum of 50 words, 1-2 photos, and a special font. 1/2 Page Tribute – $25: A maximum of 30 words, a smaller photo, and a special font . Single Line Shout- Out $10: Maximum of 20 words (NO photo). Note: If you don’t meet the word limit requirement, your submission will be edited.